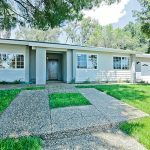 Represented Seller – Curb appeal alert! This 4 bedroom, 1 and ¾ bath home offers 1,600 square feet of living space on an enormous 11,000 square foot lot. Brand new landscaping and a custom walkway make for a stunning entrance into your new home. The property has been outfitted with travertine flooring, custom paint, crown molding and recessed lighting – new carpet has been installed in all 4 bedrooms. Both the en suite master bath and guest bath have been remodeled with new tile, new cabinetry and modern fixtures. The ample master bedroom also boasts a large walk-in closet. An open floor plan leads to a spacious living room complete with a refaced fireplace. Travertine floors continue into the large, open kitchen and dining area that offers high ceilings, a custom backsplash, lots of counter space, wood cabinetry, plenty of storage and tons of natural light. The newly landscaped backyard offers a large patio, in-ground fire pit, and ample grassy area – perfect for families and entertaining! An oversized attached garage provides additional storage space to this home. New electrical, new plumbing, new windows and a new roof rounds out this move-in ready property! 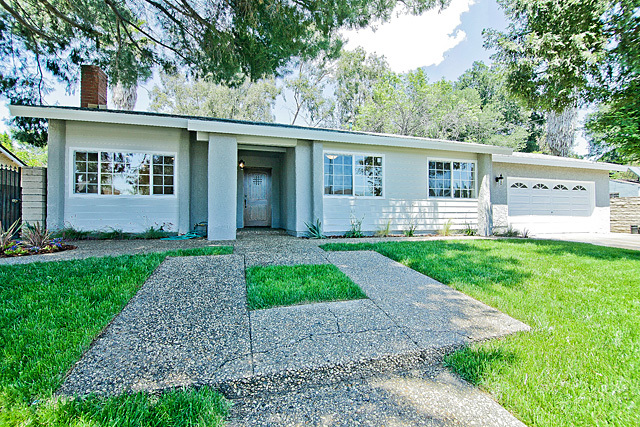 This fully rehabbed home awaits your personal touches! To see more photos Click Here.